A rare example of Apple's first computer, the Apple I, in "superb" condition sold for $174,000 at an auction in London on Tuesday. Italian businessman and private collector Marco Boglione made the winning bid, which came to about $210,000 after tax, by phone Tuesday at Christie's auction house in London, the Associated Press reports. Prior to the auction, Christie's estimated the computer would sell for between $160,000-240,000. 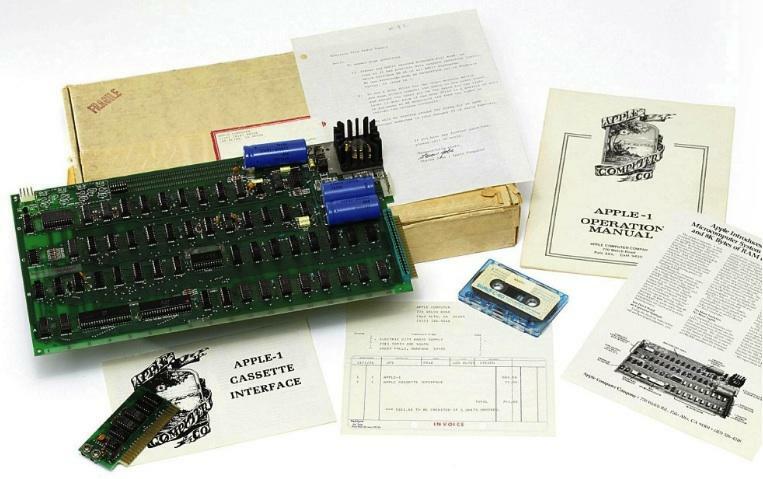 When it was released in 1976, the Apple I sold for $666.66. The Apple I computer, of which only 200 were made, has become a rare collector's item, as only 30 to 50 units are believed to still exist. The auctioned unit was listed as a "superb example" and came in its original box with a signed letter from Apple cofounder Steve Jobs. Apple cofounder Steve Wozniak, who hand-built each of the Apple I personal computers, attended the auction, offering to add an autographed letter to the lot. Wozniak told reporters the auction was a historic moment for his work. According to the AP, the auction included other pieces of technological history, such as an Enigma code-making machine and writings of Alan Turing, who is considered "one of the founders of modern computing." "Today my heart went out as I got to see things auctioned off like the Turing documents and the Enigma machine  and the Apple I," said Wozniak after the auction. "It really was an important step, (even though) I didn't feel that way when I designed it."